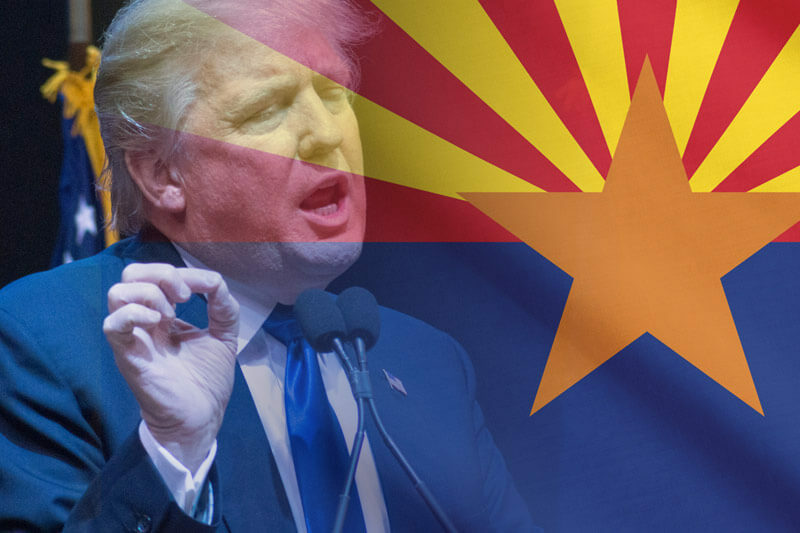 Partner Catherine Alonzo weighs in on the impact Donald Trump could have on Arizona’s seminal Senate race. John McCain has served five terms in the U.S. Senate, been elected his party’s 2008 presidential nominee and is arguably one of the most prominent lawmakers in the Republican party. But in his own words, he’s facing the “race of his life” this year to get reelected—and in large part, that is because of Donald Trump. In the wake of Trump’s rise as the presumed Republican standard-bearer this fall, there’s been a lot of discussion about the ways in which Trump at the top of the ticket could further endanger Senate Republicans who were already in for tough reelection battles, as well as making competitive races that otherwise should have been fairly certain Republican victories. Nowhere is that second dynamic more true than in Arizona, a red state—increasingly purple—with a growing Latino population that has perennially put the state on Democrats’ electoral wish list in recent years. Four years ago, now-Sen. Jeff Flake defeated Democrat Richard Carmona in that year’s Senate race by just 4 points; Arizona operatives in both parties suggest this year could be even closer. Democrats argue that a potential Trump-caused uptick in Latino turnout across the state, coupled with the party getting its top recruit in the race with Rep. Ann Kirkpatrick, could be just what’s necessary to give a Democrat a shot at winning statewide and defeating the long-serving GOP incumbent. McCain does have advantages many other GOP Senate incumbents don’t have: he’s represented the state for almost 30 years in the Senate, and has both the long-standing relationship with voters and the extensive political network that come along with that kind of electoral longevity. His campaign released a memo in mid-May noting that he has three field offices across the state and his campaign has already made 550,000 voter contacts; in terms of fundraising, he has $5.5 million on hand and had five Senate colleagues come to Arizona to raise cash with him earlier this month. Publicly, McCain has said he’s running his own race and that Trump at the top of the ticket will have little effect on his own reelection bid. But at a private fundraiser earlier this year, he acknowledged the difficulties Trump could cause him back at home in November. But Republicans in the state say McCain has a strong relationship with the Hispanic community, and that the race could inspire some of them to split their ticket. There’s been little polling in the race, but what numbers do exist from this year tend to put Kirkpatrick within striking distance of McCain: a Public Policy Polling survey taken after Trump became the presumptive nominee, for example, found McCain leading Kirkpatrick by 6 points. Another poll, from April, had them tied. Steve Voeller, a longtime strategist and adviser to Arizona Sen. Jeff Flake, suggested that McCain will be able to walk that line by making it clear that while he is willing to work with Trump, he’s also promising not to hold back if and when Trump deserves censure for his positions. Still, Democrats are already seizing every opportunity they can to tie McCain to Trump, as they’re doing with Republican incumbents across the country. Though Kirkpatrick’s campaign has not yet gone up on TV, Democrats released a digital ad switching back and forth between clips of Trump saying inflammatory things—including his comments about McCain’s war service—with footage of McCain saying repeatedly that he will support the GOP nominee no matter who it is. A Spanish-language radio ad this month, from People for the American Way, hit both McCain and Flake over their refusal to take action on President Obama’s nominee to the Supreme Court, Merrick Garland. “Is it because they want to see Donald Trump—the man who called Mexican immigrants rapists and drug dealers—get to name our next Supreme Court justice?” the ad asks. Whether that argument will stick with a quantity as known as McCain remains to be seen. Part of the benefit of being well-known as a straight-talking “maverick” is that, unlike in other states, Arizona voters may look at Trump and McCain and opt to separate the two. Reprinted from CBS NEWS. Read the original story here. Emily Schultheis is a reporter/editor for CBS News Digital. Copyright 2016 CBS Interactive Inc. All Rights Reserved.